The Eagle Nebula (M16): "X"-ploring the Eagle Nebula and "Pillars of Creation"
The hot outer atmospheres of young stars produce X-ray emission. Disks of dust and gas, detectable with infrared observations, surround many young stars. 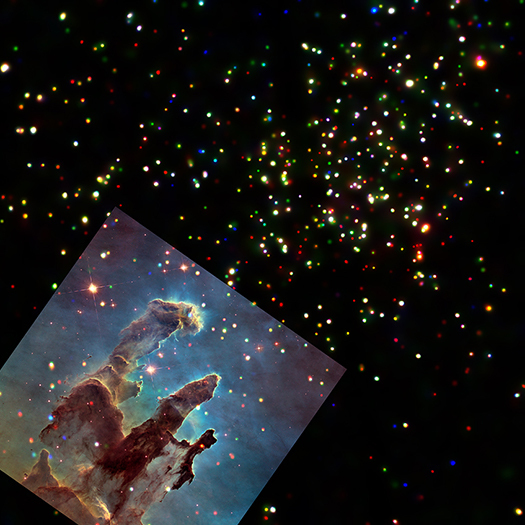 Astronomers used Chandra data and infrared observations to identify 1,183 young stars in the Eagle Nebula. Their work shows that X-ray activity in young stars with disks is, on average, a few times less intense than in young stars without disks. The Eagle Nebula, also known as Messier 16, contains the young star cluster NGC 6611. 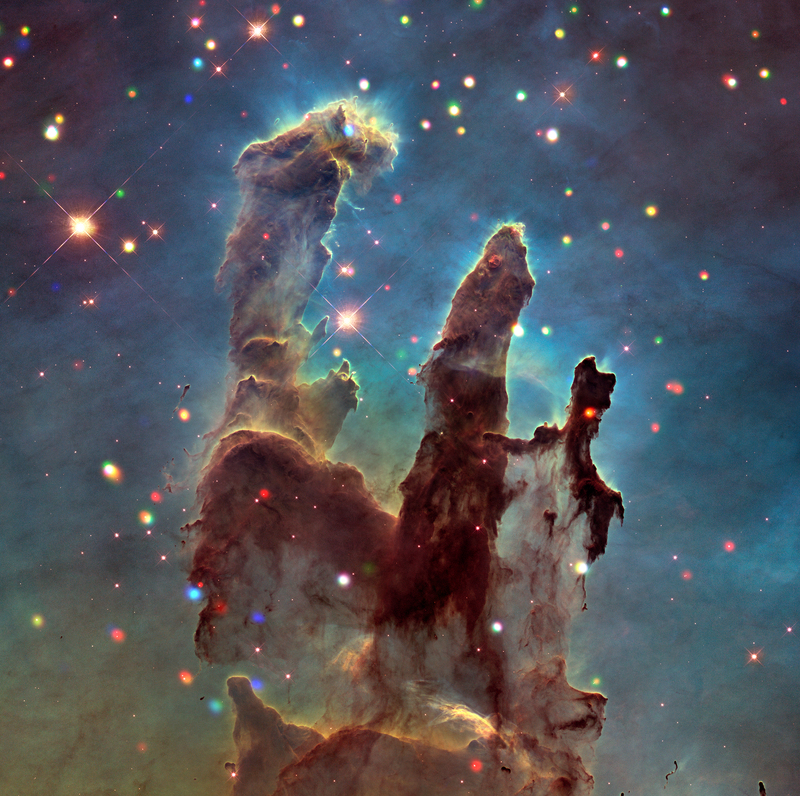 It also the site of the spectacular star-forming region known as the Pillars of Creation, which is located in the southern portion of the Eagle Nebula. Using Chandra, researchers detected over 1,700 individual sources of X-rays in the Eagle Nebula. Optical and infrared identifications with stars were used to sort out chance interlopers in the foreground or background, and to determine that more than two-thirds of the sources are likely young stars that are members of the NGC 6611 cluster. Chandra's unique ability to resolve and locate X-ray sources made it possible to identify hundreds of very young stars, and those still in the process of forming (known as "protostars"). Infrared observations from NASA's Spitzer Space Telescope and the European Southern Observatory indicate that 219 of the X-ray sources in the Eagle Nebula are young stars surrounded by disks of dust and gas and 964 are young stars without these disks. Combined with the Chandra observations, the data show that X-ray activity in young stars with disks is, on average, a few times less intense that in young stars without disks. This behavior is likely due to the interaction of the disk with the magnetic field of the host star. Much of the matter in the disks around these protostars will eventually be blown away by radiation from their host stars, but, in certain cases, some of it may form into planets. This new composite image shows the region around the Pillars, which are about 5,700 light years from Earth. The image combines X-ray data from NASA's Chandra X-ray Observatory and Hubble Space Telescope optical data. The optical image, taken with filters to emphasize the interstellar gas and dust, shows dusty brown nebula immersed in a blue-green haze, and a few stars that appear as pink dots in the image. The Chandra data reveal X-rays from hot outer atmospheres from stars. 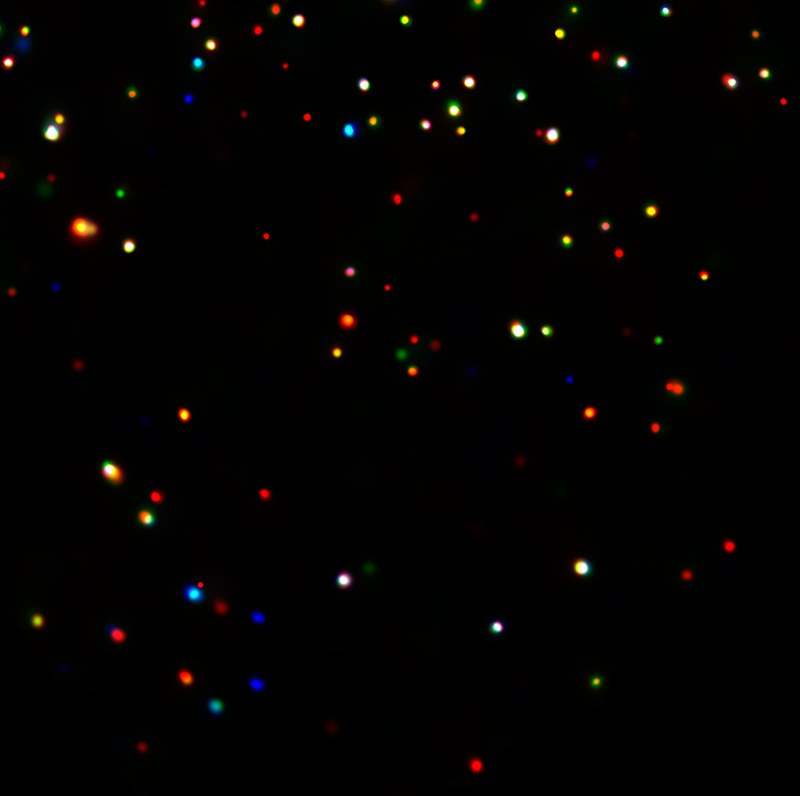 In this image, low, medium, and high-energy X-rays detected by Chandra have been colored red, green, and blue. In the image, some of the X-ray sources appear to be located in the Pillars. However, an analysis of the absorption of X-rays from these sources indicates that almost all of these sources belong to the larger Eagle Nebula rather than being immersed in the Pillars. Three X-ray sources appear to lie near the tip of the largest Pillar. Infrared observations show a protostar containing four or five times the mass of the Sun is located near one of these sources — the blue one near the tip of the Pillar. This source exhibits strong absorption of low-energy X-rays, consistent with a location inside the Pillar. Similar arguments show that one of these sources is associated with a disk-less star outside the Pillar, and one is a foreground object. A paper by Mario Guarcello, currently at the National Institute for Astronomy in Italy, and colleagues describing these results appeared in The Astrophysical Journal. NASA's Marshall Space Flight Center in Huntsville, Alabama, manages the Chandra program for NASA's Science Mission Directorate in Washington. The Smithsonian Astrophysical Observatory in Cambridge, Massachusetts, controls Chandra's science and flight operations. Coordinates (J2000) RA 18h 18m 51.79s | Dec -13º 49' 54.93"
A star-forming region with dark columns of gas and dust. About 5,700 light years from Earth. X-ray light from Chandra and optical light from Hubble Space Telescope. About 5.13 light years across. X-rays are red, green, and blue; Optical is red, green and blue.